Welcome to the University Platform for Research on Islam in Europe and Lebanon (PLURIEL)! PLURIEL has been initiated by the Federation of the Catholic Universities in Europe and Lebanon (FUCE). It aims to promote the link between researchers on Islam and the Muslim-Christian dialogue, in connection with Eastern Christians, and to foster the interaction between academics, social actors and economic organisations. The aim is also to open up research fields on Islam and to develop methodological tools to avoid cultural misunderstandings. The electronic platform is the virtual showcase of all research groups. It informs about the latest news, publications, and events including lectures, workshops, symposia and international conferences. It also offers electronic resources: videos, articles, etc. Our second International Congress has been held from 26 to 28 June 2018, at the Pontifical Gregorian University of Rome, on the theme : “Islam and Belonging“. All the lectures are available on our website, in the submenu “Ressources/Videos”. 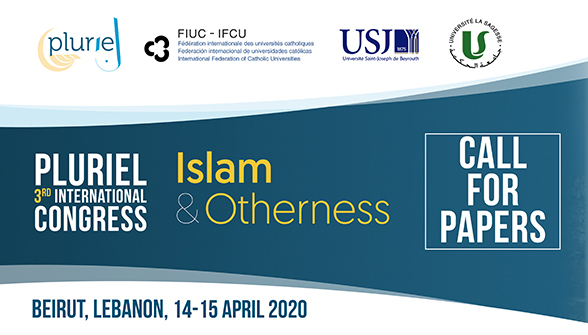 Our third Internatioanl Congress will be held on April 14th and 15th 2020 in Beirut, on the theme “Islam and Otherness”. The call for papers is open until September, 10th.